Not to be confused with Rope a Slope. Rope a Dope is an 8-player minigame in Mario Party 7. The minigame's name comes from Rope-a-dope, a technique used in boxing. The mini-game requires two players from each team to walk across a narrow, jagged path. The two players are on mirrored paths while tethered together with a rope. Each player must stop momentarily while the other walks along his or her path to loosen the rope. 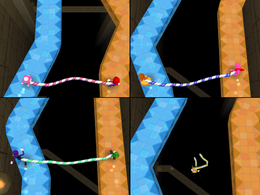 The other player then walks across the mirrored version of the path trying to decrease the tension of the rope between the two characters. When the mirrored paths are close together, both players can run quickly until the next awkward path arrives. If the rope stretches too far, both players will fall into the darkness. Rules – "Cross the narrow path to make your way to the goal... But don't let your partner drag you down!" Advice – "If one player falls off, the second player will fall as well. Take your time!" It is possible to hit the rails below with good timing, doing it sends players away from the rail somewhere else in the darkness. This page was last edited on May 22, 2017, at 18:34.